Have you been watching what’s happening in Washington D.C.? Are you frustrated? But more importantly, are you energized? I hope you’re as energized as I am because we need to keep voting and stay involved. Our families will not be defended, our jobs will not be protected, and our values will be stepped on if we don’t stay involved. I know that we’re all busy and it is difficult to make the time to volunteer on a precinct walk, but I would argue that we all must carve out an hour of our day to vote. Either on Election Day or by mail, if you have the right to vote, you need to exercise it! If you’re not registered to vote or recently moved, visit www.registertovote.ca.gov and register. Ask your friends and family to do so as well. Here’s some good news, starting in 2019, you can skip the stamp if you vote by mail thanks to Governor Jerry Brown and labor ally Assemblywoman Lorena Gonzalez-Fletcher from San Diego. Governor Brown also signed SB 100. SB 100 reinforces California’s successful energy policy to reduce greenhouse gas emissions by setting our renewable energy goal to 60 percent by 2030, and 100 percent by 2045. This law will directly produce large utility size solar projects in the coming years that IBEW will build. The law was written by State Senator Kevin De Leon, who we endorsed to be our next U.S Senator from California. We had a heavy presence in the State Legislature this year. We helped defeat some bills that would have killed construction jobs and helped pass bills that are beneficial to our industry. Below is a list of a few bills of interest that were approved by the legislature and signed by the Governor. AB 987 (Assemblywoman Sydney Kamlager-Dove) will expedite the environmental review process of the new L.A. Clipper’s arena in Inglewood. The arena will be built union. AB 235 (Assemblyman Patrick O’Donnell) will reinforce and protect our apprenticeship program and establish a separate path for new and emerging apprenticeship programs. AB 2358 (Assemblywoman Wendy Carrillo) will adopt requirements under California law set by the U.S. Department of Labor to include protections for apprentices that are sexually harassed and empower apprenticeship training committees to enforce protections. We must keep an eye on what’s happening in D.C. but act locally. The November 6th election has a lot of important issues on the ballot, not just the governor’s race. In Los Angeles County, voters will decide whether to approve school bonds, who serves on school districts and other important measures. Below is a list of our endorsements. Please share them with family and friends. 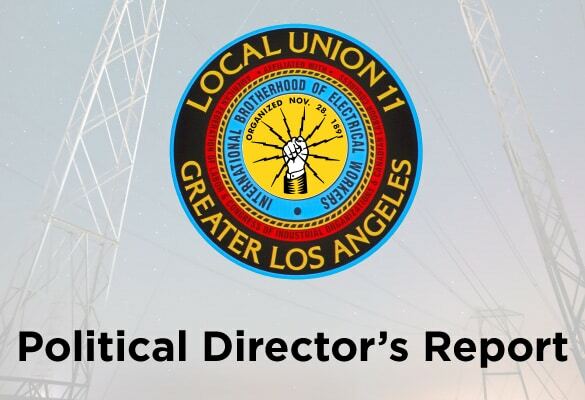 For a complete list of IBEW 11’s endorsements, click here. For a list of endorsements from the California & Nevada State Association of Electrical Workers, click here.